BlackBerry Curve 8900 gets new price at T-Mobile | BlackBerry Blast! Great news for BlackBerry Curve fans. 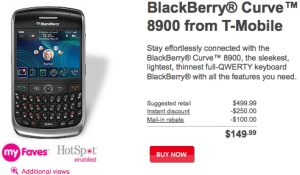 T-Mobile has dropped the price of the BlackBerry Curve 8900. You can now pick one up from T-Mobile for $149.99. You get that price after a $100 mail-in rebate. The Curve 8900 does not support 3G speeds so keep that in mind. Why would anyone make a non-3G phone at this point?